Simply press the start/test button and the gas alert extreme is ready to use, providing 2 years of continuous, maintenance free operation from the day of activation. 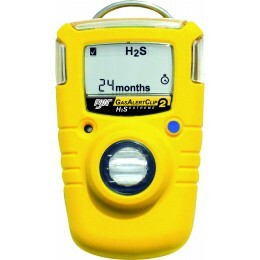 Features built in concussion proof boot, an LCD display, EMI and RFI resistance, IP66/67 rated housing for water resistance, automatic event logging records 10 most recent alarm events that can be downloaded via built in IR communication port to a printer, computer or MicroDock II docking station module. Monitor requires no calibration, sensor replacement, battery replacement or charging. Audible, visual and vibrating alarms come standard. Standard versions include stainless steel alligator belt clip, test cap and instructions.